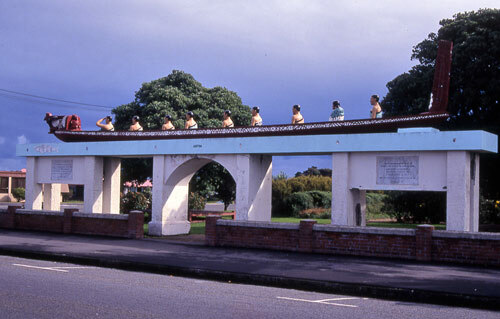 Until recently, it was believed that Ngā Rauru were descended from people of the Aotea canoe, which is depicted above these memorial gates at Pātea. However, there were an earlier group of ancestors, known as Te Kāhui Rere, who lived in south Taranaki before the Aotea arrived. A story about these people was recorded by scholar John White in the 19th century and later repeated by S. Percy Smith in his 1910 book History and traditions of the Maoris of the west coast, North Island of New Zealand prior to 1840.